Go virtual “Trick or Treating” with ‘Mike-the Skeleton’ and ‘Sally-the Witch’ in this spooky dooky, fun packed Halloween game for all the family to enjoy. 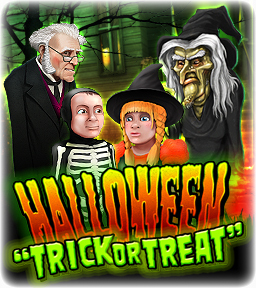 Collect lots of Treats to score valuable points and even get Tricked from time to time, jeepers creepers! Bump into Friendly Ghosts, Wicked Witches, Scary Skulls & Flapping Bats along the way. Explore the Haunted House owned by a nutty professor who lives on your street. Get lost in the Town Sewer and find your way out. Become trapped in ... then escape from a Real Witch’s House in the Pumpkin Forest. Take the short-cut home past the church, through the ‘half alive’ Graveyard and its Creepy Crypt. When you get home, empty your treat sack and work out if this has been the best year ever. Halloween: “Trick or Treat” will give you hours and hours of fun as you play the game over and over to see if you can get a higher score than your family and friends ... but be careful not to get Tricked too many times ….. moo ha ha ha haaaaaaaah ! Halloween “Trick or Treat” contains completely new and beautifully colored hidden object screens. The game has lots of mini games that are easy, medium or hard to suit all players - and of course if a puzzle is too hard it can be skipped. A highly original scoring system gives you points for all of the treats you collect, takes away points each time you get tricked and there are ‘flip flopping jack ‘o lanterns and skulls’ to give you tricks or treats throughout the game. Your best scores are kept on a high score table so you can show your family and friends.